Travel across the Canterbury Plains to reach Mt Cook by lunch time. A rare opportunity here to take an optional scenic flight for an overview of Mt Cook's ice falls, snowfields and glaciers. Your journey continues over the Lindis Pass and through the Kawarau Gorge to Queenstown. "Milford Wanderer" overnight excursion, boarding the coach in Queenstown, visitors are treated to a relaxing trip along the shores of Lake Wakatipu through rolling countryside to Te Anau. The coach driver presents informative commentaries. Stopping in Te Anau, passengers may purchase lunch (at own expense), before the coach continues along the spectacular Milford Road. There is time for photo stop and short walks along teh way. 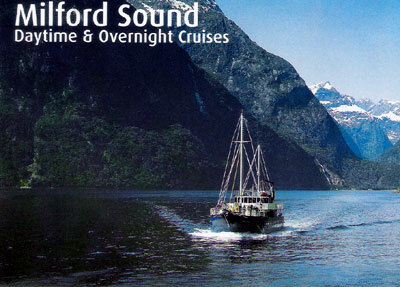 Departing from Milford Wharf, the Milford Wanderer cruises the full length of Milford Sound to the Tasman Sea. The vessel explores points of interest and there is plenty of time available to view waterfalls, mountains and wild life with the experienced nature guides on board. After reaching the open sea the vessel returns under sail (wind permitting), and anchors overnight in Harrison Cove. A hearty evening meal is provided (Self drive passengers an early start as you follow Lake Wakatipu via Kingston arriving at Te Anau for morning tea (at your own expense). A spectacular drive through the mountains, valleys and forest of Fiordland National Park awaits with a dramatic descent into Milford Sound to join the seat in coach passengers on board the "Milford Wanderer" for the rest of evening). This morning there is the opportunity to go kayaking, or explore on shore before returning to the wharf for your coach ride back to Queenstown. Travel to the Kawarau Gorge past Lake Dunstan on toward Wanaka. On past Lake Hawea as you head toward "the neck". A stop is made in Makarora before crossing the Southern Alps as you enter the Haast Pass. We pause at Knights Point to view magnificent seascapes. 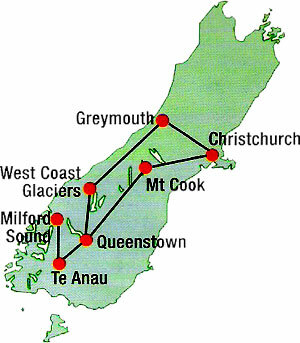 From here pass Lakes Moeraki and Paringa then past Bruce Bay to arrive at the Glaciers.